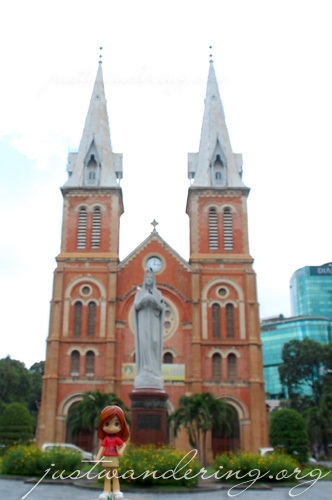 I’m in Ho Chi Minh, Vietnam. I arrived yesterday, 35 minutes after midnight, and I’m leaving the city tomorrow afternoon. It’s my first time in Vietnam and so far, I’m loving it. I’m loving the food an awful lot, though I seem to be the only one not enamored with the ban mi (baguette sandwich). I love walking around Saigon. Admittedly, I had great trepidations about going to Vietnam after reading about how crazy the motorcycle traffic is. Crossing the street is not my strong suit, and the prospect walking in a city swarming with it is just too much. Still I ventured out of my room and out into the streets of Ho Chi Minh. I was so glad I did because HCMC is a lovely, walkable city, crazy motorcycles notwithstanding. The city (the parts I’ve walked through anyway) is surprisingly green. Trees line the streets and there’s a number of public parks where you can sit down and rest after all that walking. Of course, the hurdles come with every intersection. While there are zebra crossings in most streets, the motorists will not stop for the pedestrians unless there’s someone directing the traffic. Traffic lights help make the crossing easier, though only for a little bit — a red light doesn’t necessarily mean that the motorcycles will stop. Most will, but you can count on a handful making a turn as soon as there’s a break in the traffic. The freaky thing is, it all seem normal. Yesterday, while crossing a big intersection, in the midst of a sea of motorcycles flowing in one direction, there’s a few caught in the middle, slowly inching their way through. Crossing the streets of Saigon is pretty much the same ordeal — wait for a break in the traffic and just walk. Be mindful of the oncoming traffic, but don’t be scared. These drivers are used to pedestrians. They will not stop to let you pass, but they will avoid you so just keep walking forward. And that’s what I’m going to do. I’m going to keep moving to overcome this blog slump. I’m sure you noticed I’ve been remiss with my blogging duties. I’ve been feeling uninspired lately and just can’t bring myself to write or create anything. I had every intention of doing my usual daily recap for this trip, but I thought it’d be best if I give myself a break and try to write little by little, take more pictures and heck, draw even though I don’t know how. I know so little about Saigon (except what was in “Miss Saigon” haha), so keep the posts coming! How do I contribute feeds to other places I’ve been? nice place and lots of motorcycles.. i miss the ben thanh market, lots of things to buy for pasalubong, i love the civet coffee. nice post! a true walkable city. crossing the road can be that challenging but as the locals would say… just dont move back. it’s either you move forward or just stop. also planning a trip to saigon and will probably arrive din after midnight (130 am i think), just want to know, how hard was it to get a ride out of the airport? any tips? ok lang kaya na magpalipas ng time sa airport as i’d be on the 7 am bus to Siem Reap naman? thanks! Aileen: If you love Vietnamese food, you must come here! Medyo kaloka lang talaga pagtawid sa streets! Kate: Thaaaaanks! I miss HCMC! James: Didn’t last long at the market.. the vendors are too much for me! amhuirnin: I booked for a car to pick me up with my hostel. But if you’re not going to stay naman in HCMC, wait for morning nalang at the airport. Didn’t see people sleeping there, but the airport looked pretty nice naman. I saw taxis lined up at the right side of the terminal (upon going out of the door). Good luck! i so love vietnam, i want to go back and try the open bus tours soon.